By Ryan Nugent | March 31, 2014. 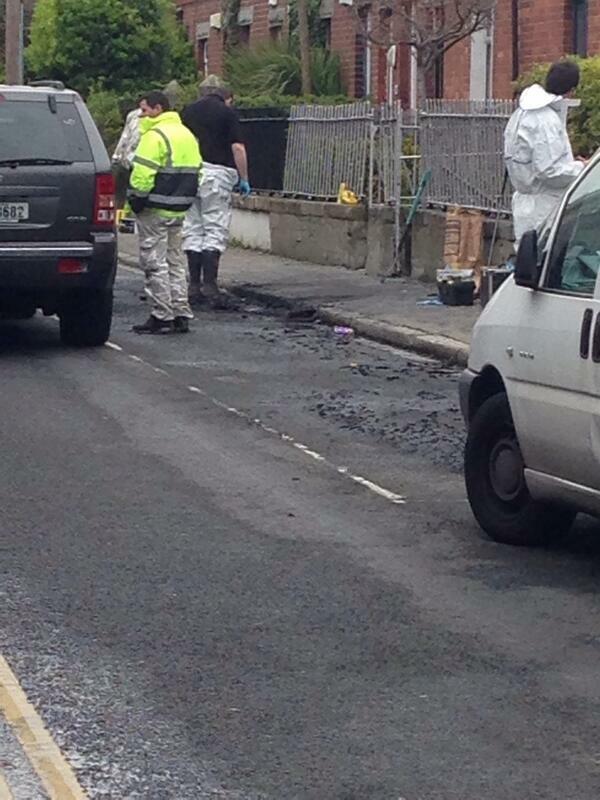 Gardaí are searching for a badly injured man who was involved in a car explosion in Dublin 8 last night. There were apparently no other casualties in the incident, which took place just after 11pm on Long Lane. 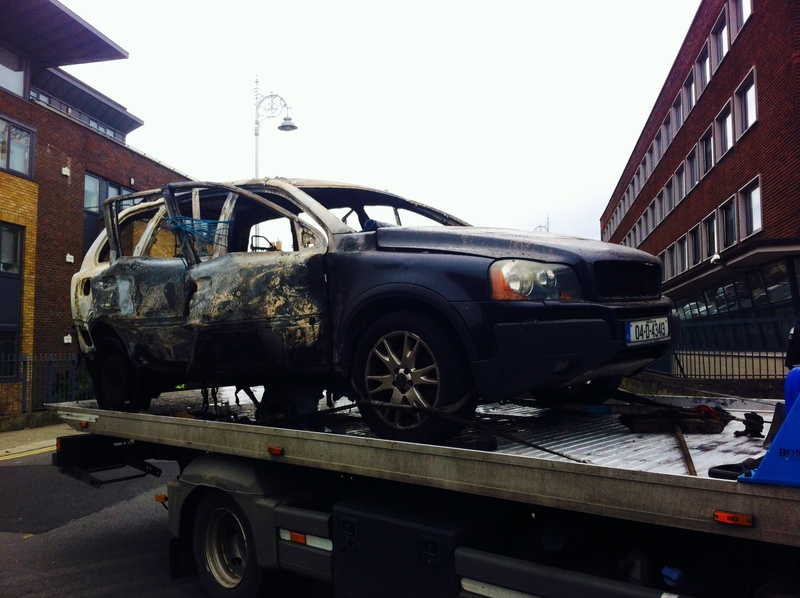 The blast destroyed an SUV and damaged nearby houses. 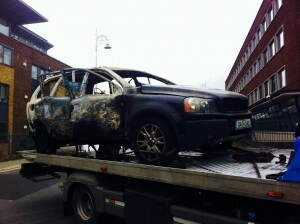 The house directly next to the vehicle, a Volvo VC60, had its windows and door blown in by the power of the explosion. A car in front of the Volvo was covered in black sheets this morning and a BMW convertible was being removed from the scene. Gardaí at Kevin Street are trying to contact a taxi driver believed to have taken a fare from a severely bloodied and injured man outside a nearby takeaway. Superintendent Dave Taylor said the Garda were concerned about the person’s injuries. “We are appealing for more witnesses, particularly this person who was seen fleeing the scene with injuries. We are concerned as to this person’s well-being,” he said. The explosion and fire occurred on the narrow laneway beside the Meath Community Hospital, a road with terraced housing and car parking spaces down one side and the wall of the old hospital on the other side. The Volvo was towed away at 2pm today as the Garda forensics team examined the damaged and blackened road. 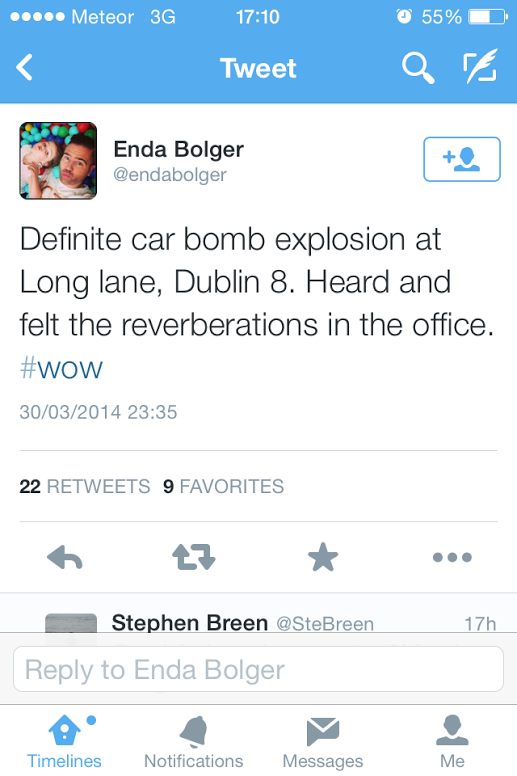 All possibilities are being considered by gardaí, a spokesman said. Many eyewitnesses believe a pipe bomb was placed under the vehicle. Gardaí are currently waiting to interview a hospitalised suspect in relation to what is believed to have been a bomb placed either inside or on top of the Volvo the Irish Independent is reporting. The suspect, a man, is being treated for wounds at the Mater Hospital.